A duet of Dubossarskiy and Vinogradov was formed by the middle of Nineties of the ХХ century. For the last 6 years the artists has risen from local celebrities to international fame. Their rightly chosen strategy permits them, being on the top of success, to be understood appropriately by Moscow and international critics. Both project participants graduated from the Surikov Academic Art Institute. 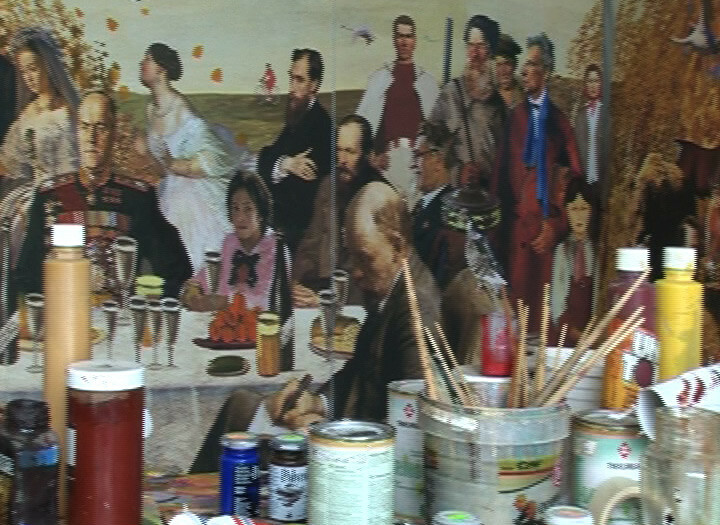 Holding up Russian painting traditions, rather basing upon the Socialist realism principals, Dubossarskiy and Vinogradov restore the monumental thematic paiting genre. They declare they work to order, but their customer is often virtual and doesn’t exist. 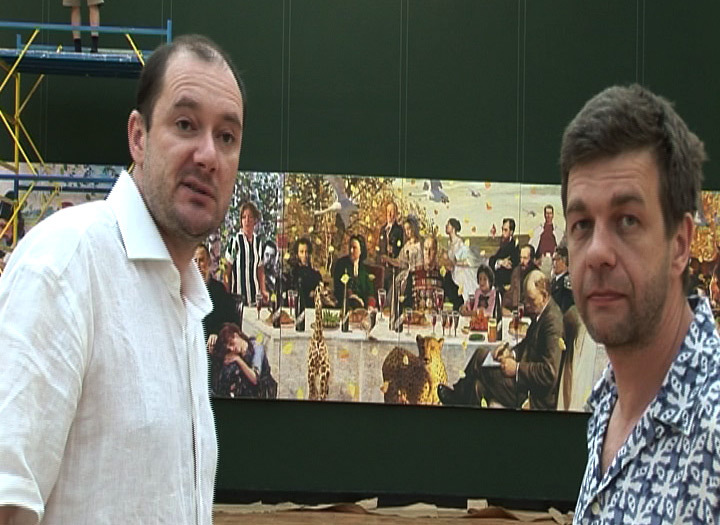 They probably mean a notorious social order which try to guess the artists painting what the “common people” like. Within the order framework the artists operate ironically with the Mass cultural stereotypes, publicity images creating a new character which is positive and triumphant. 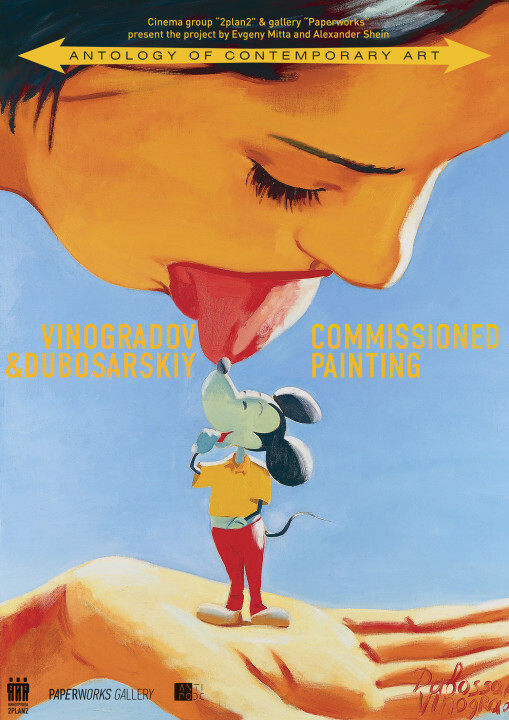 Their vivid palette and incredible combinations of various, diversified characters on the canvas multiply the virtual order real admirers. A picturesque language of Dubossarskiy and Vinogradov like many modern art representatives’s one is understood as a text. And their language is understood by viewers without decoding unlike their precursors’ one. 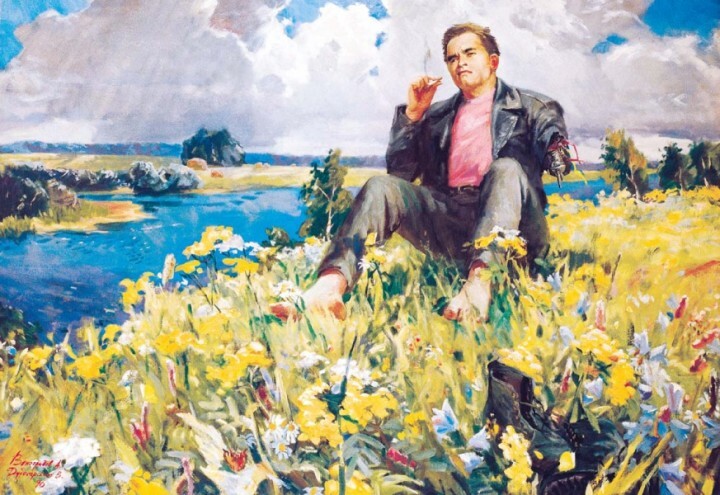 Naked bitchy tractor drivers, Helmut Kol at a young Germans’ wedding, romantic and notable figures – Yeltsin and Lebedy, Stalone painting sitting Schwarzenegger rounded by children. These funny virtual fantasies (quite in Socialist realism spirit) show the way of modern mentality with all its paradoxical curves. Victor Pelevin, a hieratic writer for young people, got up his new novel with pictures of Dubossarskiy and Vinogradov. Russian version is illustrated with American pop-stars images and in the USA the same novel will be issued with Bear and Barbie pictures, In Germany there will be German hieratic figures.